I propose early, pre-24th century contact between the Q Continuum (Q-contact) and speakers of Earth languages in Solomon Islands, South Pacific, as evidenced by the presence of <q> in the orthographies of 24 of the 68 languages there, spanning the country from west to east. I describe the sounds that <q> represents in these orthographies, using these correspondences as evidence for five separate Q-contacts. The evidence suggests Q-contact elsewhere in Oceanic, as well as in other language families, as diverse as Indo-European, multiple American Indian families, and Turkic, but that this important contact factor has heretofore been overlooked. Consequently, these findings have implications for best practice in linguistic fieldwork and historical graphemology, as well as warranting a reevaluation of previously held beliefs about intergalactic contact as it affects the history of Earth and its languages. Most readers are undoubtedly aware of the existence of the Q Continuum through the historical documentary, Star Trek, and its sequels, Star Trek: The Next Generation, Deep Space Nine, and Voyager. Aspects of Q culture have also been explored in speculative anthropology books. Speculative anthropology is the practice of creating a cultural narrative comprised of reasoned, common sense hypotheses, connections, and generalizations based on what is openly acknowledged to be minimal, suggestive, and somewhat opaque data. The name Q refers to all members individually and corporately of the race that forms the Q Continuum. While there is a mystique surrounding their seemingly supernatural powers over the laws of physics, time, and space, they are neither omniscient nor immortal, in spite of their exceedingly long lifespans, lasting for eons. These facts become relevant in argumentation below. In their interactions with humans, the Q claim their homeland is an alternate dimension only accessible to them and to anyone they choose to take there. However, even when that happens, humans are shown a metaphorical reality—one which they as lesser beings have the capacity to understand. The Q Continuum book trilogy discusses the past experiences of the individual Q, presenting them as a kind of travelogue. This is the same querulous Q who met Captain Jean-Luc Picard of the USS Enterprise in the 24th century. The trilogy is also of the speculative anthropology genre and posits the extinction of dinosaurs on Earth as the result of a battle between the Q Continuum and another powerful entity. Following the battle, that same individual Q is put in charge of watching over Earth and its inhabitants. This suggests extra-linguistic evidence for pre-24th century contact. The responsibility assigned to Q provides the context for his putting humanity on trial in the 24th C to determine whether humanity is a threat to the universe. This trial occurs during the “Encounter at Farpoint” account, which until now had been the first contact documented by a human between Q and humanity. This paper acquaints the reader with linguistic evidence for pre-24th century contact between the Q and inhabitants of the archipelago now called Solomon Islands. The country is located in the South Pacific about 1,000 miles northeast of Australia. It is inhabited primarily by Melanesians, with smaller populations of Polynesians, plus a number of immigrant groups. There are currently 68 indigenous living languages in the country, belonging primarily to the Oceanic language family, but with a handful of languages unrelated to Oceanic or to each other. The speculative anthropological accounts of the Q and a historical graphemological2 analysis of the languages of Solomon Islands intersect, leading to the inquiries and conclusions made in this study. Similar to historical phonology, historical graphemology is the study of the symbols used in orthographies, and how these change over time, including their structural properties and their relationships to the spoken language. I demonstrate here that over twenty of the country’s 68 languages manifest <q> in their 21st century orthographies. My claim is that this prevalence provides further evidence of early contact with the Q Continuum (Q-contact), prior to the documented 24th century contact between the Continuum and Captain Jean-Luc Picard of the USS Enterprise, and that this prevalence also supports the speculative anthropological accounts. This early Earth contact with the Q was nearly ubiquitous in Solomon Islands, since <q> is found in orthographies across the entire archipelago. That is, starting in Choisel and Western Provinces, representing the Northwest Solomonic branch of Oceanic, <q> is found in orthographies there and continuing to isolated languages of Guadalcanal, Malaita, and Makira-Ulawa Provinces in the center of the country, representing the Southwest Solomonic branch of Oceanic, and finally, what I call the Solomon Islands <q> continuum reaches as far as Temotu Province in the far eastern part of the country, where the Santa Cruz languages represent the Temotu branch of Oceanic (Ross and Næss 2007). Within these same boundaries, several of the <q> languages are actually non-Oceanic, which provides a clue to be pursued in the concluding discussion. The distribution of <q> in the 21st C Solomon Islands covers six of the nine provinces of the country, involving a total of 24 languages. In the sections below I discuss in more detail the distribution of these manifestations of <q> in specific languages. I elaborate on the implications of these patterns for contact with the Q Continuum in Solomon Islands with regard to frequency and duration of contact. I make inferences regarding evidence of Q-contact beyond the Solomons archipelago, both elsewhere in Proto-Oceanic (POc), as well as in language families around the world. These findings include implications for best practice in field linguistics and historical graphemology. Varisi [vrs]3 occupies the central western end of the island. Ririo [rri] (Boe et al. 2000), with around 100 remaining speakers, occupies a small area on the north coast. Babatana [baa] occupies the entire eastern end of the island. Note that an earlier name for Babatana was Sisiqa (Ross 2002), giving a clear quorum preferring <q> in their orthographies. There is currently no report on the orthography of Vaghua [tva],4 which has fewer than 3,000 speakers. At the same time, since it is related to and in contact with the other three languages of the island, it is equally likely that there will also be evidence for <q> in the orthography of Vaghua. In fact, the <q> manifestations in the languages of Choisel Province correlate with those of nearby Western Province, as shown in the next section. This means that all four indigenous languages of Choisel exhibit <q>, with the exception being the immigrant language, Kiribati [gil], spoken off the easternmost tip of the island. It is possible that the influx of Kiribati speakers occurred after Q-contact and that they were therefore not subject to it. SITAG 2016 acquaints us with the remaining five living languages of Western province. Among these are three <q> languages: Ghanoqa (also called Ghanongga) [ghn], which is 78.9% cognate with Luqa; Marovo [mvo], which is 41.3% cognate with Roviana; and Ughele [uge] (Frostad 2012), which shares 59.4% cognates with Roviana. The remaining two languages are Mono [mte], which is only 22.8% cognate with Luqa, 19.5% cognate with Roviana, and 26.2% cognate with Gela [nlg] of Central Province, and Touo [tqu], which is only 12.2% cognate with Roviana. Given their cognate percentages with <q> languages, along with preliminary sociolinguistic inquiry, it is expected that <q> will also be found in Ghanoqa, Marovo, and Ughele. However, Mono has cognates in the low-twenties with two <q> languages, but slightly higher cognates with a non-<q> language in a bordering province, where <q> is not found at all. Given these factors, it is unlikely that Mono has <q> and I err on the side of conservatism by not proposing it now. This is somewhat surprising given the location where Mono is spoken, since as we see later, the Q Continuum seems to prefer contacts on the margins of an island or a country. Several factors combine to account for the fact that fifteen of the languages discussed above all use <q> to represent [ŋg]. I propose that this clear areal phenomenon indicates that the period of contact between the Q Continuum and these language groups involved the long-term presence of representatives of the Q Continuum in the western half of the country. Even though a shorter duration Q-contact and then years of inter-language contact could account for the linguistic data, that scenario is inadequate to explain the anthropological fact of the near reverence held for <q> in these languages. For example, speakers of these <q> languages are resistant to using <g>, as Touo and other Solomon Islands languages do. And they insist on this spelling even though speakers of other languages are confused by the orthography. It appears that there is great unity in this reverence for <q> (or might we say Q). From other documents, such as Q-Zone, we know that the Q generally avoided such prolonged contact, due to being isolationist and easily becoming bored. One wonders, then, if this god-like Q was indeed the same individual Q met by Picard years later, or perhaps a break-away group/individual, either one of which grew to need the adulation offered by speakers of the <q> languages. It is certainly consistent with the prankster personality of the individual Q. Alternatively, perhaps the Q extended their time here after becoming fascinated with the turquoise sea and caiques flying through the trees. But such propositions remain in the realm of speculative anthropology. Putting these hypotheses aside, the extended duration of this contact contrasts with what is found in the rest of the country. We turn now to two more languages using <q> for the sequence [ŋg]. There are six indigenous languages spoken on Guadalcanal, plus Pijin [pis], the language of wider communication, and 'Are'are [alu] a settlement of speakers from Malaita on the far eastern tip in Marau Sound. Of these six languages, only the following two have <q> equated with [ŋg] in their orthographies (SITAG 2016): Ghari [gri], (Ivens 1934), spoken on the western end of Guadalcanal, encompassing both the north and south coasts and encompassing Honiara, the national capital; as well as Doku [lgr], (Unger 2008), also known as Lengo, spoken on an area of the north central coast, which is contiguous to Ghari only at its westernmost border. In spite of using the same symbol for the same sound as the languages discussed above, it does not require a proposal of identical or additional Q-contact to account for them. While these two languages are contiguous to each other, neither of them is contiguous to the <q> languages of Western and Choisel Provinces; rather there are stretches of open ocean in between, as well as the island of Lavukal where the non-Austronesian, non-<q> language Lavukaleve [lvk] is spoken. It is also unlikely that this is a new Q-contact, since the other instances of Q-contact discussed below all show a new sound represented by <q>, rather than the [ŋg] of the extended contact in Choisel and Western Provinces. Therefore, I hypothesize that the Guadalcanal <q> languages are a contact phenomenon, indicating post-Q, inter-language contact, perhaps for marriage purposes, and that the children acquire the <q> language spoken by one of the parents. This seems the most straight forward explanation of this areal phenomenon. Part of the contact almost certainly involved a split in ideologies, since for Doku, it is only one segment of the population which uses <q> (Unger 2008:220). It will be interesting to see if further research can determine reasons for the ideological split and whether the same is true of the five or so varieties of Ghari. Do they all use <q> or only some of them? Let’s turn now to quoting scholars about uses of <q> which do not represent [ŋg], in order to illustrate other Solomon Islands contact points for the Q Continuum. The Toqabaqita [mlu] language is found in the very north of the island of Malaita. In it, <q> symbolizes glottal stop [ʔ] (Lichtenberk 2008). But all of the other nine north Malaitan languages use a straight apostrophe for this sound instead, as reported by Keesing (1985) for Kwaio [kwd]; Ivens (1931) for Kwara'ae [kwf]; Featherstone (2011) for Lau [llu]; and Lovegren, Mitchell, and Nakagawa (2012) for Wala [lgl]. The straight apostrophe is also used for glottal stop in the two south Malaitan languages, Sa'a [apb], and 'Are'are. In light of this conventionalized use of straight apostrophe for glottal stop in the other eleven languages of Malaita, the use of <q> in Toqabaqita is somewhat quixotic. Furthermore, since the use of <q> as glottal stop does not align geographically, orthographically, or anthropologically with the 17 languages where <q> symbolizes [ŋg], this clearly indicates a separate and briefer contact with at least one member of the Q Continuum, as opposed to the apparent extended contact found in the Choisel-Western languages. Such a single-language contact would have been possible due to the location of Toqabaqita on the northern tip of Malaita. Although the Q are known to appear out of nowhere, so to speak, it is evident that access by sea or over the sea would also not have required transit through or over other language areas, allowing for isolated acquisition of <q> here without contact spreading to other languages in northern Malaita. Moving now to southern Malaita, I quell nay-sayers by citing historical evidence for <q> in Sa'a, which is not reflected in the 21st C orthography. For example, Ivens (1929) reports the use of <q> to represent [pw], but in the current orthography, the more transparent <pw> represents [pw] (Ashley 2012). As for the other southern Malaitan languages, there is no evidence for the use of <q> anywhere in the history of 'Are'are (Ivens 1932), either for [ʔ] as in Toqabaqita or as [pw] as in Sa'a, and in fact, there is no [pw] sequence at all in 'Are'are. There is, however, a current effort to use the actual IPA symbol [ʔ] as an orthographic letter with an uppercase and lowercase version, as illustrated by the language name ʔareɂare, (Roxanne Gebauer, personal communication). Future research would need to be conducted to determine two things: First, whether given its grapheme shape this might also indicate Q-contact and second, if it does indicate Q contact, whether it was at the same time as the Toqabaqita or not, since [ʔ] is the sound targeted for both languages. The orthographic situation for Oroha [ora], currently highly endangered, is unclear. It is said to be 78% cognate with Sa'a and 80% cognate with 'Are'are, languages which are 75% cognate with each other (SITAG 2016). Given these similarities and the lack of a current orthography, it is impossible to determine whether [pw] exists in Oroha or whether it would be represented by <q>. While it almost certainly would have [ʔ], the expectation is that it would be represented by the more conventional straight apostrophe, rather than the IPA symbol or <q>. Therefore, I do not propose Oroha as part of the Solomon Islands <q> continuum at this point. I conclude, then, that parallel to Toqabaqita, and for quite the same reasons, the Sa'a data indicates a separate, isolated, and brief Q-contact. That is, the use of <q> as [pw] shows no parallels geographically, orthographically, or anthropologically with the languages where <q> is [ŋg]. Additionally, [pw] is sufficiently distinct from [ʔ] to warrant positing two separate contacts on Malaita. Likewise, the location of Sa'a on the southern tip of Malaita, mirrors the isolation of Toqabaqita in the north, and makes single-language contact possible on this part of the island, as well, with two caveats. First, Q-contact would necessarily be from the east, in order to avoid contact with the Oroha territory on the extreme tip of the island. And second, the Q-contact with Sa'a must predate the north Malaitan, Lau settlement off the eastern coast of Sa'a territory. See language map. Taking the quest further eastward, we reach the island of Makira, which forms the largest area of Makira-Ulawa Province. According to Mellow (2012), only one of the five indigenous languages there exhibits <q> and that language, Owa [stn], is spoken at the far eastern end of Makira on the small island of Santa Ana and the bordering coastal areas of the big island. In Owa <q> is used for the sound [ɓ], a voiced, bilabial implosive. Apparently, the closely related Kahua [agw] language on the eastern end of the big island also has [ɓ], but it is not represented by <q>. Without question, we find again here on Makira the <q> language situated on the periphery of the island and the presence of <q> has not been passed to any neighboring languages, either by the Q Continuum or through inter-language contact. So following the same argumentation regarding the sounds represented by <q> above, we see that [ɓ] in Owa is phonetically dissimilar to the other sounds represented by <q> in Solomon Islands, i.e., [ŋg], [ʔ], and [pw]. Thus, the Owa situation should be considered the third isolated, short term Q-contact, such as was posited above for Toqabaqita and Sa'a. This brings us across nearly 200 miles of open ocean to Temotu, the easternmost province of the country, where we find the last known occurrence of <q>. Unlike the consonantal representations in the rest of the country, here <q> is unique in that in the common orthographies of the island it symbolizes a high, central, rounded vowel [ʉ] (Boerger 1996, 2007). The grapheme is present with a high frequency in Natqgu (also called Natügu) [ntu], one of four closely related Oceanic languages spoken on the island of Santa Cruz (Boerger 1996, 2007). While vernacular literacy is less developed in the related languages of Nalrgo (also called Nalögo) [nlz] (Boerger and Zimmerman 2012), Noipx (also called Noipä) [npx],6 and Engdewu [ngr] (Vaa 2013), speakers of those languages recognize that the Natqgu orthography can also serve them7 and they have begun to use it to represent their own languages. Consequently, assuming that the use of <q> in the other three Santa Cruz languages will persist, I posit that <q> on Santa Cruz represents one Q-contact, with borrowing accounting for its occurrence in all four Santa Cruz language orthographies. Note though, that <q> is not present in Äiwoo [nfl] (Næss 2017), located in the nearby Reef Islands, and the fifth member of the Reefs-Santa Cruz (RSC) family. This restricts the Q-contact to Santa Cruz Island itself. Thus, I have no qualms positing the Natqgu contact as the fourth, isolated, and short term contact with the Q, such as was seen above for Toqabaqita, Sa'a, and Owa. While I claim that <q> occurs throughout Solomon Islands, that sweeping statement needs some qualification. There is a huge swath of the country right in the middle where <q> is either not present or is present due to borrowing from a <q> language. The three provinces with no manifestation of <q> are Isabel Province, Central Province, and Rennell & Bellona Province, commonly known as RenBel. Recall also that the two occurrences of <q> in Guadalcanal Province were both attributed to borrowing from a <q> language and were not proposed as Q-contact. Given that, the four provinces together can be said to form a <q>-free zone running north and south, right in the middle of the island chain. This zone makes it even more reasonable to claim that the occurrences of <q> which do not represent [ŋg] are separate, isolated Q-contact situations, rather than a) borrowing due to contact with <q> languages or b) part of the same Q-contact which brought <q> to symbolize [ŋg]. In the discussion above I have presented evidence for five Q-contacts in Solomon Islands. These included one extended contact in Choisel and Western Provinces, which also affected Guadalcanal Province, in addition to four separate contacts of shorter durations in the provinces of Malaita, Makira-Ulawa, and Temotu. There are further inter-related remarks, speculations, and qualifications that could be made about these facts. As stated in the introduction, as part of their near omnipotence, one quality of the Q is that they can travel through time. This would make it possible for them to have had an effect on the forms of the symbols of the International Phonetic Alphabet or IPA, through influence on societies where they had a presence. Their knowledge of the IPA would make it possible for them to manipulate <q> and its relationship to other symbols. With that in mind, it is interesting to note that four of the five contacts use <q> to represent sounds symbolized in IPA with a curved letter portion and a descender or ascender, giving them visual similarities to the letter <q> itself. This is even more pronounced when one visualizes a hand-written < > with a rightward curve in its tail. 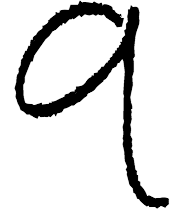 That is, [ŋg], [ʔ], [pw], and [ɓ], (but not [ʉ]), exhibit the curve-plus-tail features. Even the uppercase <Q> has a curve-plus-tail appearance. One might quibble about whether the IPA symbols also having this curve-plus-tail feature is significant or rather a happy accident, but it seems clear that whenever there was an unconventional sound or sound sequence to represent members of the Q Continuum apparently inserted themselves into the orthography design by eloquently advocating for <q> and that their counsel was adopted for the orthographies of the languages discussed above. I hypothesize that it made sense to them that the grapheme <q> could represent any sound or sound sequence, since the Q themselves can take any shape they want. But we can also extend this curve-plus-tail hypothesis a bit further. We know that societies on Earth often make statues in the likeness of humans. Extrapolating from that, we might assume that the same is true of extraterrestrial societies, like the Q. In mankind’s interactions with them, the Q have normally manifested as humanoid, probably to enhance interactions with humans leading to some level of conquest. But the curve-plus-tail shape of the <q> and <Q> discussed above leads me to speculate that perhaps the original physical bodies of the Q before their evolution and advancement could have been as curved, tailed beings. Furthermore, given that there are a considerable number of Q-contacts in Solomon Islands, perhaps at some point in their developmental history they were tailed, aquatic mammals similar to dolphins. To pursue that idea more adequately, there is, in fact, some 23rd century support for such a hypothesis. This is recorded in the documentary film Star Trek IV. It reports that in the year 2286 the crew of an earlier starship, also with the name USS Enterprise, is in exile on the planet Vulcan. This crew included Captain James T. Kirk and First Officer Spock. They receive an inter-planetary distress call from Earth, warning all spaceships to stay away because a huge cylindrical probe has entered orbit, cutting all power and evaporating the oceans. Using a recording of the probe’s message, Spock figures out that it is trying to communicate with extinct humpback whales. Therefore, the crew’s only solution is to go back in time to obtain a pair of humpbacks who could then communicate with the probe and send it back where it came from. It may be a stretch, but here again we have a tailed, aquatic, mammalian race in contact with Earth. Could this also have been a pre-24th century contact between the Q, or a related race, and the people of Earth? The aquatic theory is further supported when we look at the Oceanic parent language, Proto-Oceanic (POc), for which *q has been reconstructed. This indicates an even earlier contact between the Q Continuum and POc, the parent language from which many Solomon Islands languages originated. If there was a Q presence as early as POc, we need to inquire what this might this mean. Extending this assumption even further, it could perhaps indicate the presence of Q individuals as part of one of the largest diaspora in history. That is, perhaps the Q inserted themselves into the voyages of those who have been called the Lapita peoples, not to vanquish, but to influence them. And since we’re discussing this, it does not take much imagination to flip the <p> in <Lapita> to get a <q> with the result being <Laqita>. The presence of the Q in the Lapita migrations could have been intentionally hidden, especially if the Q had not yet revealed themselves to the humans, but were still impersonating them—an application of a principle similar to the prime directive by a species outside the United Federation of Planets.8 These hypotheses together should be explored by further research efforts because they could contribute to a fuller explanation of the name of the Q, their preference for <q> in orthographies, their role in human history, and a discovery of their physiological development. But Q-contact is likely not unique to the Oceanic languages. It only takes a moment to realize that while *q is not reconstructed for Proto-Indo-European (PIE), <q> occurs in some branches of PIE, namely Italic and Germanic for a start, as evidenced by the relatively high occurrence of <q> in French [fra] and English [eng], for example. Furthermore, we also encounter <q> in numerous American Indian language orthographies. In fact, recent news about orthography indicates that the government in Kazakhstan is proposing changes which would have them writing the country’s name as Qazaqstan and the name of its Turkic language as Qazaq [kaz] possibly another example of Q-contact being uncovered. Taken together, the Indo-European, American Indian, and Turkic data, then, provide evidence that the Q were not restricted to aquatic environments at all points of Earth contact, since many of these languages are spoken in landlocked areas. However, our current data set is inadequate, making broader generalizations necessarily tentative. Therefore, readers are encouraged to report on <q> phenomena in the orthographies of languages and language families with which they are most familiar, as together we continue to explore the early history of intergalactic contacts on Earth. Given this need for more data and reliable data, the findings reported on here also have implications for best practice in linguistic fieldwork. For example, it is important to not only collect oral data and transcribe it with a writing system of the fieldworker’s design, but it is also critical to document extant indigenous orthographies, in order to look for further instances of Q-contact. This serves as a critique of previously recommended fieldwork procedures (Boerger 2011, Boerger et al. 2016) and necessitates revising them to also include orthographic data as part of the targeted primary data for a comprehensive corpus. The conclusions reached here also require changes in existing language descriptions to take into account previously overlooked evidence of extraterrestrial contact. In other words, together we must re-examine earlier procedures and assumptions about the history of earth and its languages in light of this research. Ashley, Karen C. 2012. Semantics of Sa'a transitive suffixes and thematic consonants. MA thesis. Graduate Institute of Applied Linguistics. Boe, Harry Truman, Edison Biliki, Edwin Kaboke, Martin Love, Ester Nalatüti, Isaiah Poloso, Monica Qilazuka, Jonathan Takubala, and Frederick Vot’boc. 2000. Ririo-English Dictionary. Draft version circulating in the community. Boerger, Brenda H., Stephen N. Self, Sarah Ruth Moeller, and D. Will Reiman. 2016. Language and Culture Documentation Manual. LeanPub. Boerger, Brenda H. and Gabrielle Zimmerman. 2012. Recognizing Nalögo and Natügu as separate languages: Code-splitting in ISO 639-3. Language and Linguistics in Melanesia 30.1:96–133. Boerger, Brenda H. 2011. To BOLDly go where no one has gone before. Language Documentation and Conservation 5:208–233. Boerger, Brenda H. 2007. Natqgu Literacy: Capturing Three Domains for Written Language Use. Language Documentation and Conservation. Hawaii: University of Hawaii Press. 1(2):126–153. Boerger, Brenda H. 1996. When C, Q, R, X, and Z are vowels: an informal look at Natqgu orthography. Notes on Literacy 22.4. Corston-Oliver, Simon. 2011. Roviana. In John Lynch, Malcolm D. Ross, and Terry Crowley (eds) The Oceanic Languages, 467–497. Routledge, London/New York. Davis, Karen. 2002. A Grammar of the Hoava Language, Western Solomons. Canberra: Pacific Linguistics 535. Featherstone-Santosuosso, Giordana. 2011. Lau of North Malaita, Solomon Islands: A language description. MA Thesis, University of Auckland, New Zealand. Frostad, Benedicte Haraldstad. 2012. A Grammar of Ughele, an Oceanic language of Solomon Islands. PhD thesis. LOT, Trans 10. Utrecht, The Netherlands. Ivens, Walter G. 1929. A dictionary of the language of Sa'a and Ulawa, S.E. Solomon Islands. London & Melbourne: Oxford University Press. Ivens, Walter G. 1931. A Grammar of the Language of Kwara ‘Ae, North Mala, Solomon Islands. Bulletin of the School of Oriental Studies, University of London, 6.3:679–700. Cambridge University Press. Ivens, Walter G. 1932. A Vocabulary of the Language of Marau Sound, Guadalcanal, Solomon Islands. Bulletin of the School of Oriental Studies, University of London, 6.4:963–1002. Cambridge University Press. Ivens, Walter G. 1934. A Grammar of the Language of Vaturanga, Guadalcanal, British Solomon Islands. BSOAS 7:349–375. Keesing, Roger M. 1985. Kwaio Grammar. Department of Linguistics, Research School of Pacific Studies, Australian National University. Lovegren, Jesse, Alice Mitchell, and Natsuko Nakagawa. 2012. The Wala language of Malaita, Solomon Islands. Studies in the Languages of Island Melanesia, 3. Canberra: Asia-Pacific Linguistics. Lichtenberk, F. 2008. A Grammar of Toqabaqita. De Gruyter: Berlin/Boston. Mellow, Greg. 2013. A Dictionary of Owa: A language of the Solomon Islands. Series: Pacific Linguistics, De Gruyter Mouton. Naess, Åshild. 2017. A short dictionary of Äiwoo. Series: Studies in the Languages of Island Melanesia A-PL 35, College of Asia and the Pacific, The Australian National University. Obata, Kazuko. 2003. A Grammar of Bilua: A Papuan Language of the Solomon Islands. (Pacific Linguistics, 540.) Canberra: Research School of Pacific and Asian Studies, Australian National University. Ross, Malcolm D. 1996. Contact-induced Change and the Comparative Method: Cases from Papua New Guinea. In by Mark Durie & Malcolm Ross (eds). The Comparative Method Reviewed: Regularity and irregularity in language change. 180–217. Oxford: Oxford University Press. Ross, Malcolm D. 2002. Sisiqa. In John Lynch, Malcolm D. Ross, and Terry Crowley (eds). The Oceanic Languages, 456–466. Routledge, London/New York. Ross, Malcolm and Åshild Næss. 2007. An Oceanic origin for Äiwoo, the language of the Reef Islands? Oceanic Linguistics 46:456–498. Scales, Ian. 2003. The Social Forest: landowners, development conflict and the State in Solomon Islands. PhD Thesis, Australian National University. SITAG (Solomon Islands Translation Advisory Group). 2009 (Lee Montgomery), 2014 (Paul Unger), 2016 (James M. and Karen C. Ashley). Alphabets of Solomon Islands languages. SITAG: Unpublished, in-house compilation of orthography data. Thurston, William. 1989. How exoteric languages build a lexicon: Esoterogeny in Western New Britain. In VICAL 1: Oceanic Languages, Papers from the Fifth International Conference on Austronesian Linguistics, part 2, ed. by Ray Harlow and Robin Hooper, pp. 555–579. Auckland: Linguistic Society of New Zealand. Unger, Paul. 2008. Aspects of Lengo Grammar. MA thesis. Trinity Western University. Vaa, Anders. 2013. A grammar of Engdewu. An Oceanic language of the Solomon Islands. PhD dissertation. University of Oslo. Waterhouse, W. H. L. 1927. The Baniata Language of Rendova Island. Man 27.64–47. Royal Anthropological Institute of Great Britain and Ireland. Zobule, Alphaeus G. 2002. Luqa Grammar. Unpublished teaching grammar for Luqa speakers written in Luqa. 1 These conclusions could not have been reached without hours of research, including repeated viewings of the Star Trek: The Next Generation, Deep Space Nine, and Voyager historical documentaries. The author thanks Daniel Boerger, Alex Boerger and Micah Boerger for their participatory engagement with these documentaries. She also thanks Jori King, Susan F. Schmerling, Paul Unger, and Speculative Grammarian editors for input on earlier drafts of this paper. As always, any errors, quirks, or infelicities remain the full responsibility of the author. 3 In this paper, <q> languages are in black bold font at first mention, while relevant non-<q> languages are in a gray bold font. Other languages discussed in passing use an unenhanced font. 4 In the orthographies of Solomon Islands languages <gh> represents a voiced, velar fricative [ɣ]. 5 One logical decision is insufficient to claim early Vulcan contact, but such contact could also explain the Touo resistance to Q/<q> and must not be ruled out as a queue for future research. 6 Noipx (aka Noipä) was recognized as a separate language in early 2016 as a result of fieldwork done in 2015 by the author and a team of research interns, most notably Jeremiah Aviel and Valentina Alfarano. 7 Personal communication, Kennedy Clq. 8 The Star Trek prime directive prohibits members of the United Federation of Planets from interfering with the internal development of other civilizations. This involves not imposing values and ideals, as well as not giving technologies that are beyond the current stage of development of a particular race or civilization. Map credits: The map Q Continuum Languages of Solomon Islands (shown above and the cropped version on the cover) was prepared by Trey Jones, adapted from the map Solomon Islands location map by NordNordWest, licensed under CC BY 3.0. Additional data from: Michael Dunn & Malcolm Ross. 2007. Is Kazukuru Really Non-Austronesian? Oceanic Linguistics 46:210–231; and Gary F. Simons and Charles D. Fennig (eds.). 2017. Ethnologue: Languages of the World, Twentieth Edition. SIL International.